In its 2011 Formula One Sporting Regulations, issued today, the FIA has made it clear that it intends to take a tougher stance on driving standards. In the wake of a number of controversial incidents in recent years, and a perceived lack of continuity in the response, the FIA has signalled that it intends stamping out a number of current practices. Article 20.2 sees the sport's governing body crack down on drivers changing direction more than once as they try to defend a position. "Manoeuvres liable to hinder other drivers, such as more than one change of direction to defend a position," are not permitted, it states, while, "deliberate crowding of a car beyond the edge of the track or any other abnormal change of direction" is also banned. "Drivers must use the track at all times," declares Article 20.3. "For the avoidance of doubt the white lines defining the track edges are considered to be part of the track but the kerbs are not. "A driver will be judged to have left the track if no part of the car remains in contact with the track. Should a car leave the track for any reason the driver may rejoin. However, this may only be done when it is safe to do so and without gaining any advantage. 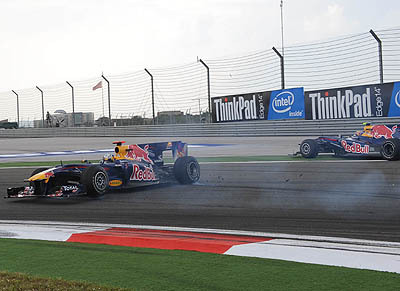 Article 20.4 sees backmarkers warned that they must defer to a faster car at the first opportunity. "As soon as a car is caught by another car which is about to lap it during the race the driver must allow the faster driver past at the first available opportunity. If the driver who has been caught does not allow the faster driver past, waved blue flags will be shown to indicate that he must allow the following driver to overtake. "Any driver who is deemed to be ignoring the waved blue flags will be reported to the stewards of the meeting," it adds. Whereas stewards have previously had the authority to hit drivers with fines and time penalties, or grid demotions at the subsequent race, they will now have the power to exclude a driver from the race classification or suspend him from the next event. With an eye on the fact that 2011 sees the greatest number of rounds in the sport's history, a curfew rule is being introduced which it is hoped will reduce team members' working hours. The curfew will run from midnight to 06:00 when practice starts at 1000 on Fridays, and from 01:00 to 07:00 when practice starts at 11:00 on a Saturday. However, over the course of the season, each team will be permitted four exceptions to the rule. F1 to use 'green' engines from 2013?